Video clip synopsis – Three lighthouse keepers and their families are the only residents on remote and windswept Maatsuyke Island, off the south-west coast of Tasmania. Broadband MP4 lighthouse_bb.mp4 (7.9MB), suitable for iPods and computer downloads. 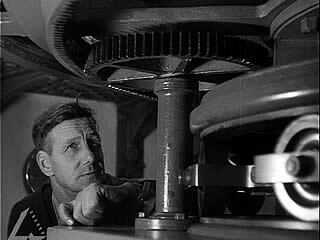 Lighthouse Keepers and Their Families is an excerpt from the film The Lighthouse Keeper (11 mins), produced in 1949. The Lighthouse Keeper: There are few lonelier jobs than that of a lighthouse keeper. Around Australia’s long coastline are the lighthouses that provide navigational aids to ships at sea. Many of these are sited in lonely spots, but the people who tend them never fail to keep the lights ablaze. This program looks at the lifestyle of a family living in the lighthouse on Maatsuyker Island, off the southwest coast of Tasmania. The Lighthouse Keeper is a National Film Board Production. Produced by the Department of Information. Lighthouses are essential for the safety of ships. Each has its own special sequence of flashing, and this tells navigators where they are located. They are always placed on land, and warn of the presence of rocks and land that need to be avoided in an area. This lighthouse is situated on Maatsuyker Island below Tasmania. For many years three lighthouse keepers and their families lived on this island. It is an isolated location where food and supplies were brought in every few months by boat. It is a challenging environment where the weather is changeable, often with very cold winds. Despite these challenges, these lighthouse keepers never failed to keep the lights ablaze. It might be a lonely occupation but for certain people, they enjoy the lifestyle in a remote place like Maatsuyker Island. There is also something beautiful about lighthouses. Today, however, with changes in technology which automate lighthouses, lighthouse keepers have become part of a bygone era. Imagine you are a child living on an isolated island. You have no computers, phones, electricity or school. There are only three small families living on the island with you. In what ways do you think isolation would affect your sense of belonging? Which filmic techniques of the opening sequence create a sense of isolation? The family is only ever shown in a long shot surrounded by wilderness. In what ways does this convey a sense of belonging or not belonging? What emotions does the music stir in the audience? In your opinion why did the director choose to use this music? What parts of the narration and which filmic techniques set the environment of the island in opposition to the families’ sense of belonging? What are the duties of men and women on the island? Which genders are shown in exteriors, and which in interiors? From the above, what does this tell you about which roles belonged to men and women in 1949? Why do you think the director has used thriller filmic techniques to depict this story of family life? Compose a letter from one of the children to their parents. In this letter discuss your sense of belonging, community, isolation and your thoughts about your future. Consider the pros and cons of being raised on a small island and whether you would choose to raise a family in that same way.